A country of sharp inequality and class polarization, Honduras recently returned to the frontlines in the battle for Latin America’s soul. The terrain of struggle has shifted on multiple occasions over the last seven months, following the military coup against the democratically-elected President, Manuel “Mel” Zelaya. The battle entered its latest phase last week with the ascension to power of Porfirio “Pepe” Lobo. Lobo was inaugurated on January 27, following his victory in the fraudulent November 29 election last year. Hundreds of thousands of Hondurans greeted the inauguration with a spirited march through the capital, Tegucigalpa, against the coup and his presidency. Zelaya, a member of the broad tent Liberal Party who defeated Lobo in the 2005 Presidential campaign, was removed from power and forced into exile in the middle of the night on June 28, 2009. This was the first successful coup d’état in Latin America – following unsuccessful attempts against Venezuelan President Hugo Chávez in April 2002 and Bolivian President Evo Morales in 2008 – since Alberto Fujimori’s auto-golpe in Peru in 1992. Roberto Micheletti, a member of the Liberal Party’s right-wing faction, was quickly installed as the coupist President. Zelaya’s mistake was the adoption of moderately progressive measures designed to improve the lives of the poor Honduran majority. Among other things, the minimum wage was raised by 60%, mining exploration restricted, free school enrolment introduced, and subsidized gas was purchased from Venezuela. Zelaya also led Honduras into the Bolivarian Alliance for the Peoples of Our America (ALBA). While Zelaya’s progressive credentials and proximity to Chávez – the Honduran elite like to claim that he had become a puppet of the Venezuelan leader – shouldn’t be overstated, these measures angered the Honduran elite, an obscenely privileged and tiny fraction of the country’s population, uninterested in even a modest redistribution of wealth. It was, however, Zelaya’s efforts, supported by the social movements, to initiate constitutional reform – misleadingly presented by the elite and regurgitated unquestioningly by the North America mainstream press as a power grab – that constituted the final straw. The new Lobo regime and the golpista press are presenting the transfer of power as a return to democracy and thus an end to the coup. 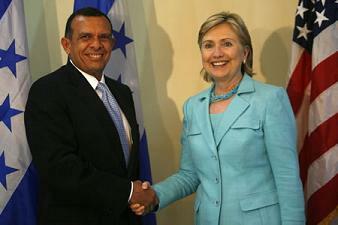 Lobo, they claim, marks a new beginning for a democratic Honduras under a new government of national reconciliation. Unsurprisingly, this position is being echoed by U.S. and Canadian imperialism. These same powers supported the coup, their claims to the contrary nothwithstanding. They have consistently ignored the documented repression of the anti-coup movement, and have helped circumvent Zelaya’s efforts to return to power at every turn (for backgrounder on Canadian and American support for the coup see T. Gordon, “Acceptable Versus Unacceptable Repression,” press releasesby Canadian Minister of State for Foreign Affairs on Honduras, Peter Kent, and Greg Grandin’s articles atwww.thenation.com). According to the Committee of Family Members of the Disappeared of Honduras (COFADEH), a human rights organization founded in the 1980s, at least 36 anti-coup activists have been assassinated, almost certainly a low estimate they acknowledge, as many families of those killed are too afraid to come forward for fear of reprisal. Many political murders are covered up, COFADEH argues, as gang killings. El Frente, the national resistance front, puts the number of assassinations at more than 130. COFADEH has also documented at least 95 cases of torture and the illegal detention of hundreds more. This reign of terror cast its long shadow over voting day on November 29. An atmosphere of military repression and intimidation prevailed. Little more than bad theatre, the election was boycotted by the anti-coup resistance movement, offered no candidates opposing the coup, and has not been recognized by most Latin American governments. The official voter turnout figure of over 60% provided by the Honduran Electoral Tribunal is almost certainly inflated. One official with the Tribunal, speaking on the condition of anonymity for fear of reprisal, told the Real News that the figure was pure invention (see Bullet #290 “Honduras: The Coup That Never Happened” by Tyler Shipley). Hagamos Democracia, an NGO contracted by the Tribunal to provide early reporting, put the turnout at 47.6%. Drawing on grassroots reports from across the country, leaders of the Resistance suggest that turnout was probably closer to 30%. Assistant Secretary of State, Arturo Valenzuela, suggested that “things are moving very much in the right direction” with Lobo and pledged to help the regime normalize its relations with the rest of the region. Both the American and Canadian governments of course add their requisite refrain, that Lobo needs to promote reconciliation, suggesting that perhaps a Truth Commission would be a step in the right direction. These bold partisans of justice have little to say, however, on the amnesty law already passed by the Honduran Congress, and supported by Lobo, which will insulate military and political leaders responsible for the coup and the subsequent repression from prosecution. In any case, how could reconciliation with opponents of the coup ever be achieved (should anti-coup forces even desire that) by a government elected under the coup? Thanks to the American and Canadian governments it’ll be business as usual for foreign capital, much of it dominated by North American corporations. Honduras is an important destination for sweatshop manufacturing and (increasingly) tourism capital, while foreign mining companies, dominated by Canadians, are salivating at the prospect of the opening up of new mining concessions under the new regime. Anti-mining activist, Carlos Danilo Amador, notes that the Mining Association of Honduras and the Honduran National Business Council, of which Canadian miners are members (indeed, leading players in the former) were important supporters of the coup. He also points out that all of the current exploration concessions in the country are owned by Canadians. “This is the new Canadian colonization of Honduras,” Amador points out, “replacing the Spanish and the Americans” in the mining sector. In a meeting in Tegucigalpa on the eve of Lobo’s inauguration, Radio Globo journalist Felix Molina suggested that Honduras is entering the fourth moment of the coup. The first phase, involved its preparation and execution. The second saw the gathering of domestic elite and imperial forces around the San José Accord. The third carried out that accord. As quickly as the state’s posters of calm and consensus marked the avenues of Tegucigalpa, graffiti artists of the resistance offered their response – Fuera golpistas asesinos! Out with the Coupist Assassins! The corporate media casts Lobo as the “elected president,” whereas the Frente repudiates him as the “son of a coup.” The corporate media celebrates a national unity government of integration, whereas the Frente refuses dialogue with Lobo’s regime, and denounces it as the latest incarnation of the original coup of June, 2009. This war of words found its material expression in the protesting cascades of hundreds of thousands, marching from downtown toward the airport, on January 27. The march paid homage to Zelaya – as he finally escaped four months of sequestration in the Brazilian embassy for exile in the Dominican Republic – and, at the same time, announced that the struggle against the coup regime would continue. We approach the first row of military police and the crowd rings out, urging folks to study and learn so they’ll never have to be on the other side of the barricades. Estudiar, aprender, para chepo nunca ser! A group of insanely energetic 10 year olds dance amidst the marchers, chanting concordantly for the death of the golpistaregime. Peasants, trade unionists, feminists, and different left groupings walk arm-in-arm and cheer ecstatically as cars moving in the other direction honk in solidarity. Teenagers lean out of the windows of a passing bus, their fists raised in the air. ¡El pueblo está en las calles exigiendo libertad! The people are in the streets demanding liberty! ¡Adelante, Adelante, que la lucha es constante! Forward! Forward! In Constant Struggle! We demand a Constituent Assembly! Todd Gordon teaches politics at York University in Toronto. Jeffery R. Webber teaches politics at the University of Regina. They are currently writing a book on Canadian imperialism in the Americas. Both were in Tegucigalpa in January as part of a delegation of Rights Action, a group active in building North-South solidarity in Honduras since 1998. This article originally published on Counterpunch.